For anyone with easy access to Lille – and that includes anyone in London, which is 90 minutes from Lille by direct Eurostar train, at a price – the exhibition of works by the painter Louis-Léopold Boilly (1761-1845) is well worth visiting. It is on display at the aptly named Palais des Beaux-Arts: the photograph (left) shows the north-east corner of this truly palatial building. 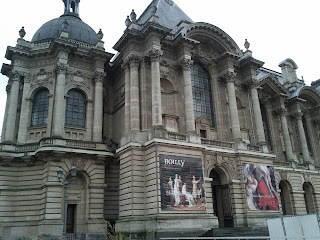 Boilly was a local artist: he came from La Bassée (about 20km from Lille), practised painting at Arras (about 30km from La Bassée) and moved away to Paris in 1785. Boilly’s work is admired for its precision and virtuosity, treasured for its value as a historical witness, and loved for its humour and sympathy. 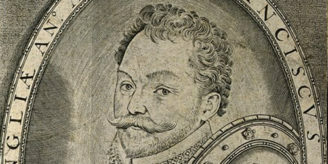 These qualities are well-displayed in the exhibition, and indeed in this fittingly mounted and framed self-portrait drawing (right: no. 34) on loan from the Museum of Fine Arts at Boston, Massachusetts. 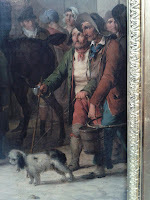 We discover that the stories shown in these paintings were given to Boilly by Calvet himself. As with a series of prints from the same period (Estampes pour servire à l’histoire des moeurs et du costume des françois dans le dix-huitième siècle, 1773-1784), the “authors” of the picture include not only the painter or engraver, but also the person who devised it (in this case Calvet), even if he never lifted a paintbrush or an engraving tool. To help earn his family’s bread and butter, Boilly painted many small portraits, all in the same format but nevertheless distinctive. He may have painted over 4,000 of them; they certainly appear regularly in the auction rooms. 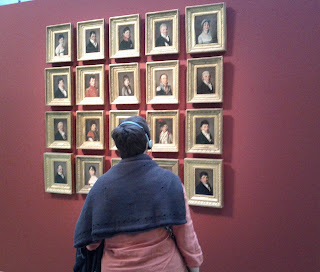 In the exhibition their character and number are suggested by a wall containing twenty of them hung together at the beginning of the exhibition. Boilly’s virtuosity is shown in his amazing trompe l’oeil paintings. One (no. 169) bought by Lille in 1974 is available in the museum shop in the form of trays, mouse-mats and fridge magnets. The catalogue reveals (p. 63) that the term trompe l’oeil was coined in 1800 to describe Boilly’s paintings, though the genre itself had existed at least since the 17th century. Another superb example not in the exhibition was sold at Christie’s New York last week (The Art of France, New York, 25 January 2012, lot 144: image, right, from Christie’s catalogue). It shows the back of a torn canvas, with a cat looking though the hole at a pair of mackerel hanging from the back of the stretcher: all painted in oils! For this marvel a European private individual paid $842,500 (£541,649, €650,981) including buyer’s premium. 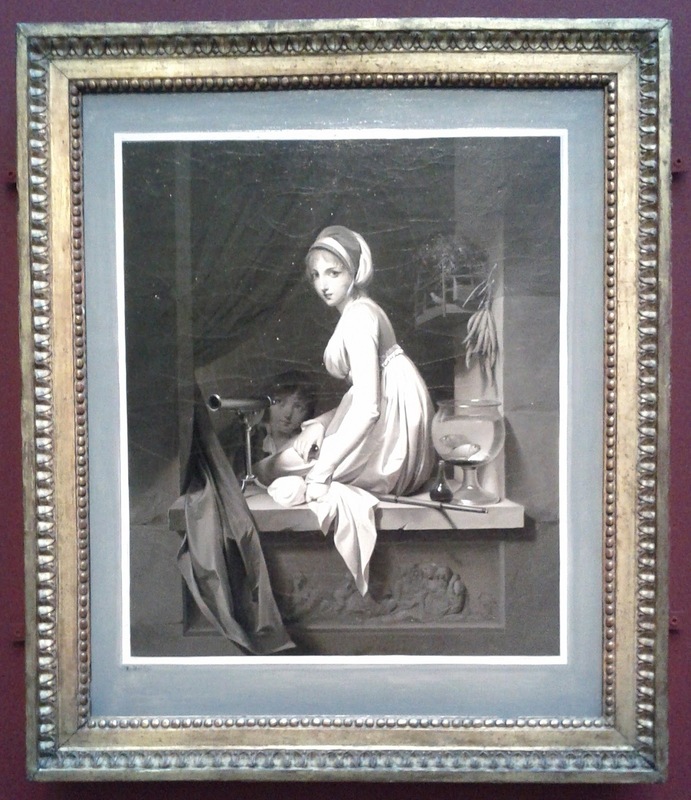 In the exhibition, Boilly’s genius is demonstrated in his trompe l’oeil oil paintings in grisaille imitating non-existent engravings after his own paintings: one such grisaille painting is lent by the National Gallery, London (reproduced further below). Caught up in the French Revolution, Citoyen Boilly could not but be overwhelmed by daily life in Paris, which thereafter dominated his paintings, giving them great historical value. 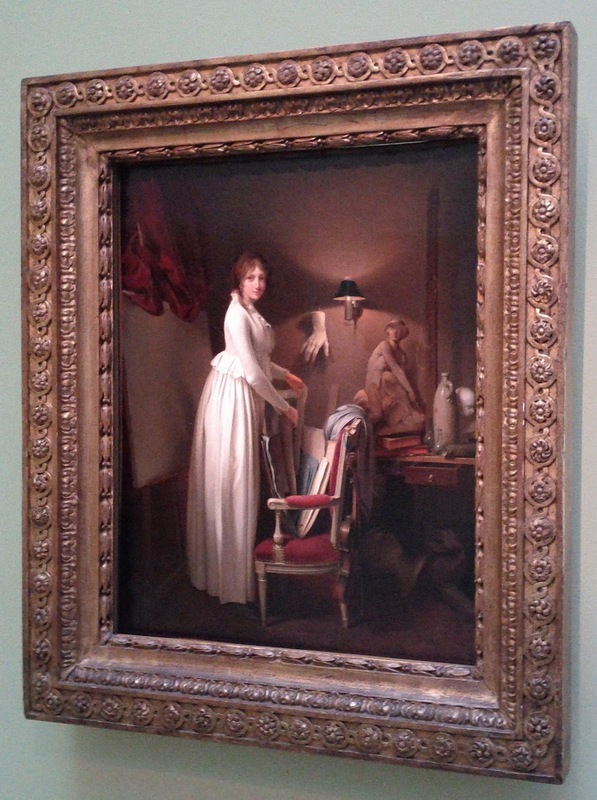 In portraiture, his masterpiece is the Atelier of Isabey from the Louvre (no. 68), showing 31 men, mostly fellow artists, in the studio of the painter J.B. Isabey. They include the rising stars of the day such as the flower painter Pierre-Joseph Redouté, the Romantic mythologist Anne-Louis Girodet, the brilliant pair of neoclassical architects Percier and Fontaine, and Boilly himself. 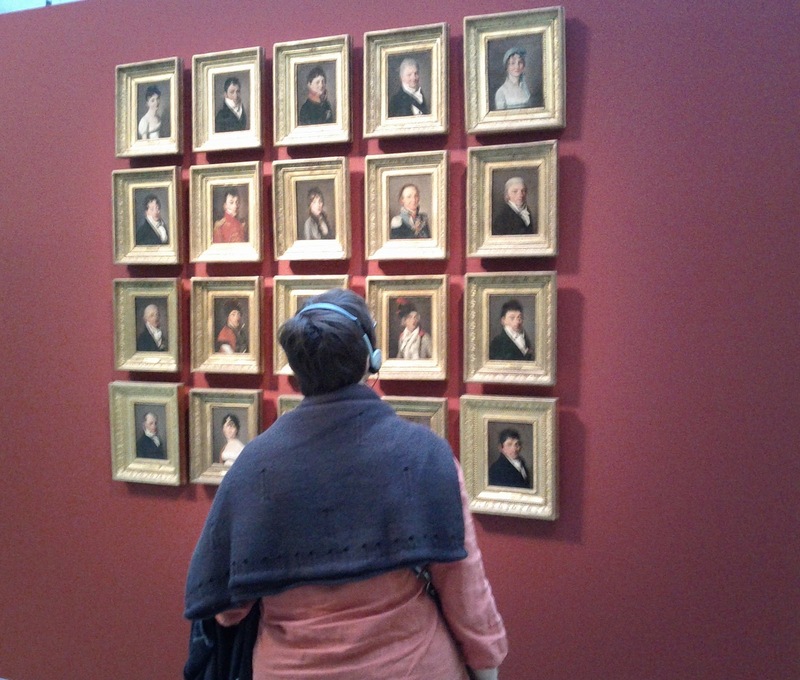 Equally significant are those omitted: the big guns of the establishment, such as Gros, David, and Ingres. 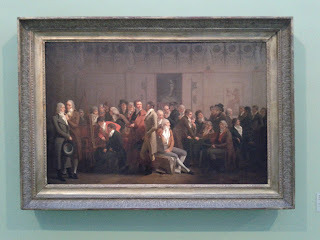 A sensation when first exhibited in An VI (1798), at Lille it is shown with a number of painted sketches for the figures, showing the great amount of work that Boilly put into both the individual portraits and the mellifluous composition. One of the studies was stolen in 1964: its reproduction in the catalogue (p. 156) may lead to its identification. Paris as a city of pleasure is brilliantly portrayed in the Entrance to the Turkish gardens (1812, no. 136) which was bought by the Getty Museum at Christie’s New York on 27 January 2010. Boilly normally works on a very small scale by the standards of his time, but this picture is large for him (73.3 x 91.1 cm.) and contains a very rich cast of characters amusing themselves in the square outside a Turkish restaurant and ice-cream parlour. One can see why the Getty was prepared to put aside $4.5 million for it. Also exhibited is one of Boilly’s preliminary drawings for the painting, which was identified in Antwerp as a result of the publicity surrounding the Getty’s purchase of the oil painting: the Getty Museum subsequently bought the drawing too (no. 137). It is one of several paintings which excel at showing contemporary moeurs: others are paintings of women playing billiards (no. 126, from the Hermitage, St Petersburg), a father giving his daughter a geography lesson (no. 138, from the Kimbell, Fort Worth), and conscripts from 1807 passing through the Porte Saint-Denis (no. 130 from the Musée Carnavalet, Paris): a tiny detail in the lower right corner of the last painting shows a veteran who has lost his sight (left). 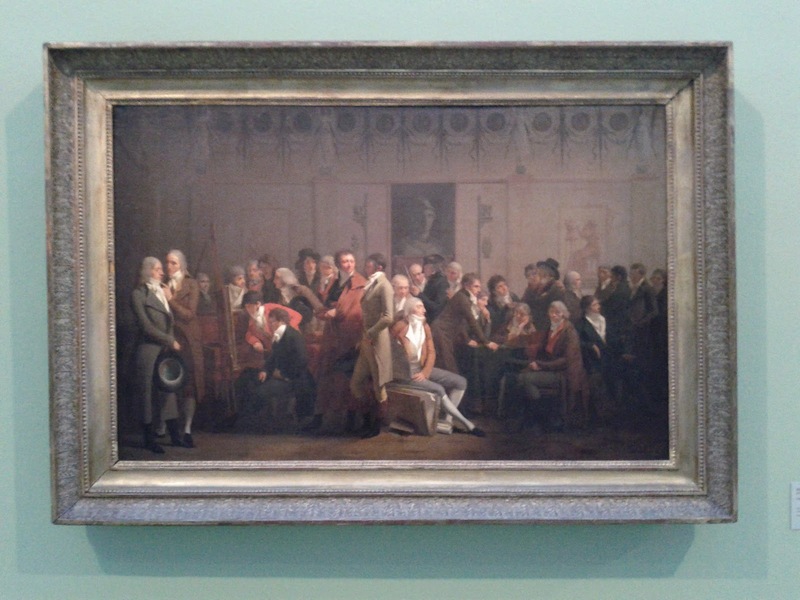 One of these contemporary scenes (here dated to 1807) is a painting lent by the Wellcome Library (above: no. 131). 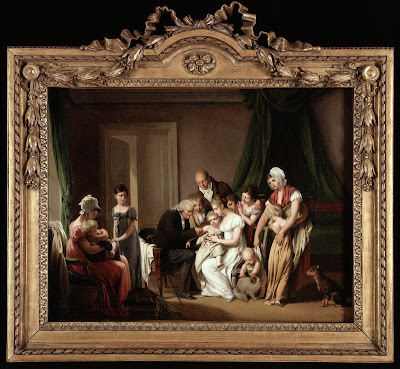 It shows vaccination being carried out, within the first decade of its introduction into France: the procedure is said to have been first carried out by Pinel at the Salpêtrière in 1800. It was shown next to no. 128, on loan from St Louis, Missouri, which is from the same year and about the same size, and shows a less affluent family following the progress of Bonaparte’s army through Prussia on a map. 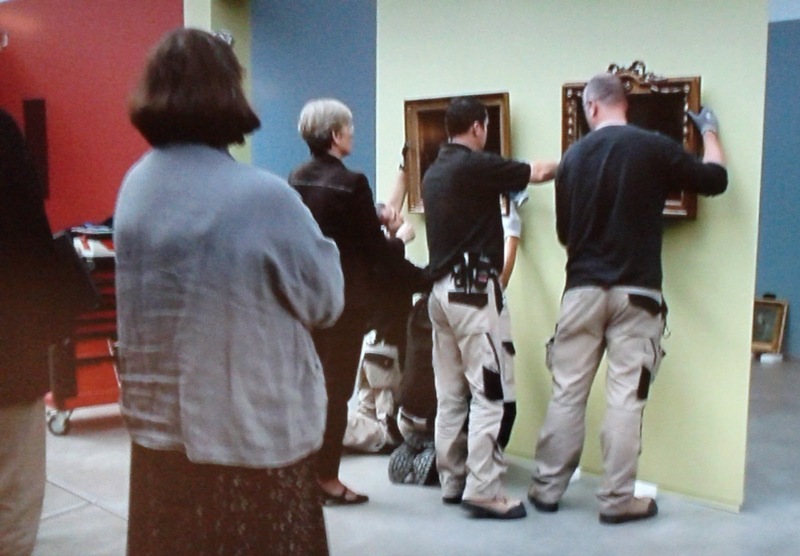 Above and right, the installation of the Wellcome Library and St Louis paintings, supervised by Gillian Boal (Wellcome Library), Thierry Germe (Architect) and Annie Scottez de Wambrechies (Conservateur en Chef). 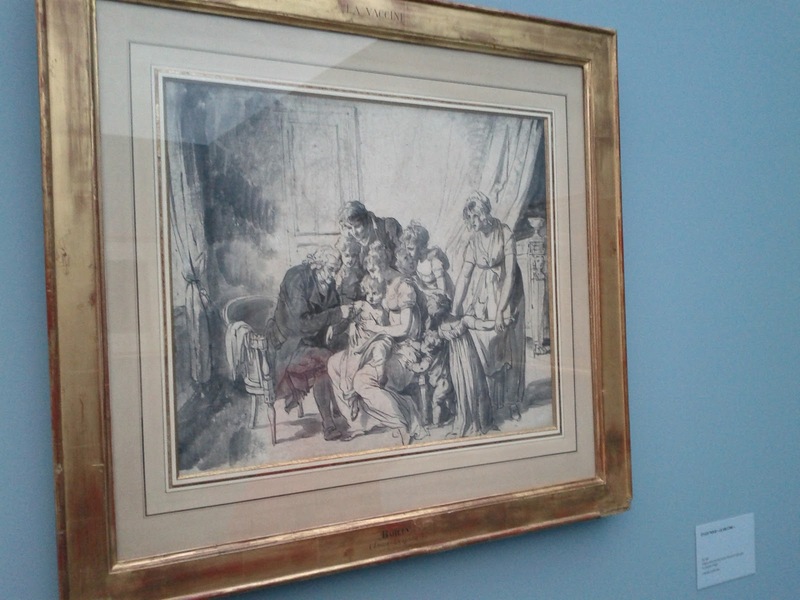 Also on display was one of Boilly’s drawings for the Wellcome Library painting (below: no. 132), suggesting that he had previously thought of it as a more compact and intimate scene, but later enlarged it to emphasize the gravity of the occasion. The catalogue includes an essay by Humphrey Wine (of the National Gallery, London) on Boilly and Great Britain. It was a subject well worth investigating, but unfortunately it reveals that the British have been little interested in Boilly. 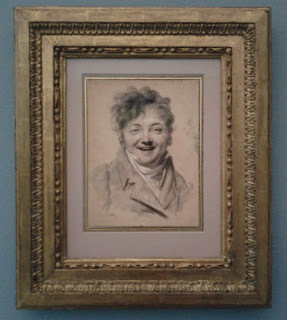 Perhaps this is not surprising considering the amounts paid by British collectors for the home team: painters such as Devis, Zoffany, Edward Bird, Wheatley, Rowlandson, David Wilkie, and many other artists whose work overlaps with some aspect of Boilly’s. Boilly was of course collected by the 4th Marquis of Hertford (the creator of the Wallace Collection, so named after his illegitimate son), but then Hertford was specializing in French art of the period. As a notable exception to the general British indifference, the author is kind enough to mention the Wellcome Library painting, which was acquired in 1994. Provenances in the catalogue show who really did value Boilly. Williamstown, Massachusetts (pop. 7,754) in the Berkshires provides no fewer than three paintings. One (left: no. 65) had belonged to the Singer Sewing Machine heir Robert Sterling Clark, and passed to the Sterling and Francine Clark Art Institute in Williamstown. 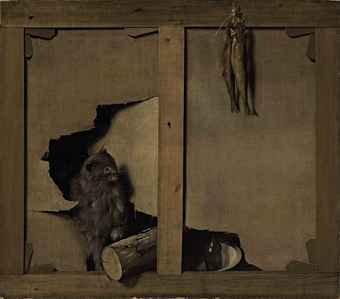 Following his example, the Clark Institute has bought another two pictures by Boilly, including a trompe l’oeil piece (no. 163). Lille itself, other institutions in the Nord such as Saint-Omer and Tourcoing, Versailles, the Musée du Louvre, the Musée Marmottan (where the present writer was privileged to see a smaller Boilly exhibition in 1984), the Musée Carnavalet and other Paris institutions, have also acquired valuable works which are on show here. 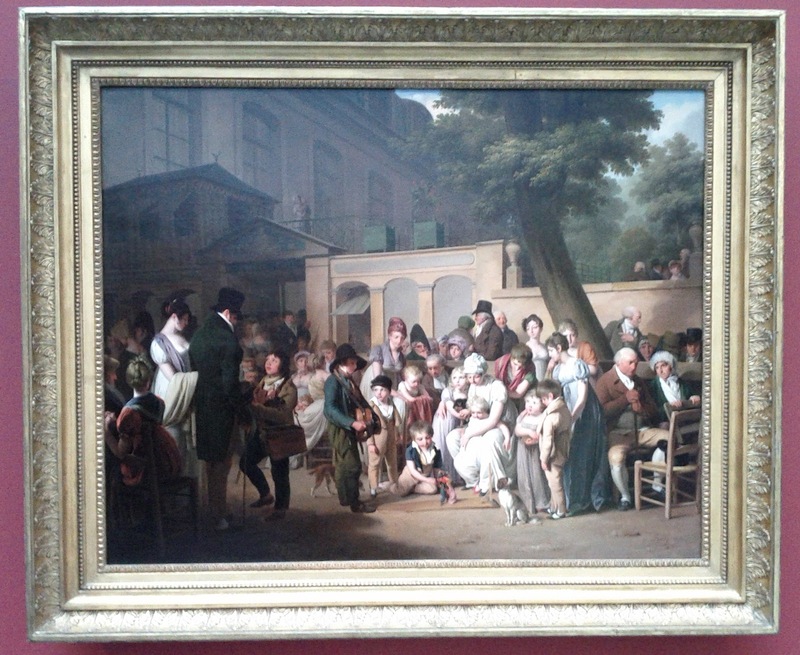 In Boilly’s own lifetime, Prince Nikolai Borisovich Youssoupoff (1751-1831) owned four of the paintings now on display in Lille, one of which was bought before 1812: two are from the Pushkin Museum, Moscow (nos. 43 and 66), one from the Hermitage, St Petersburg (no. 126), and one was sold by the Soviet Union and is now on loan to Dallas Museum of Art (no. 44). Prominent dealers who have committed themselves to his work in recent times include Agnew’s (nos. 128, 129, 131), Hazlitt Gooden and Fox (nos. 113, 138, 163, all now in America), Didier Aaron (191), and Etienne Breton (nos. 105, 189). It is striking that three of the four paintings on loan from British collections have belonged to women. The National Gallery’s grisaille (left: no. 186) was presented in 1937 by Emily Yznaga, of a Cuban sugar-refining family, and had belonged to her sister Doña María Consuelo Yznaga, sometime Duchess of Manchester (1858-1909). 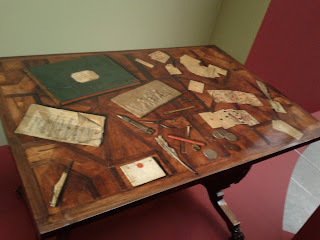 The extraordinary trompe l’oeil table from Wimpole Hall, Cambridgeshire (below: no. 164, National Trust) had been bought by Rudyard Kipling’s daughter Elsie, Mrs George Bambridge (1896-1976). The Wellcome Library painting came from the sumptuous residence of Graziella Patiño de Ortiz-Linares, in the Avenue Foch, Paris. Another painting, the one owned by Robert Sterling Clark, had previously been bequeathed by Alfred De Rothschild to Almina, Countess of Carnarvon, who in 1895 had married the 5th Earl (d. 1923): she sold the painting from Highclere in 1925, and died as recently as 1969. 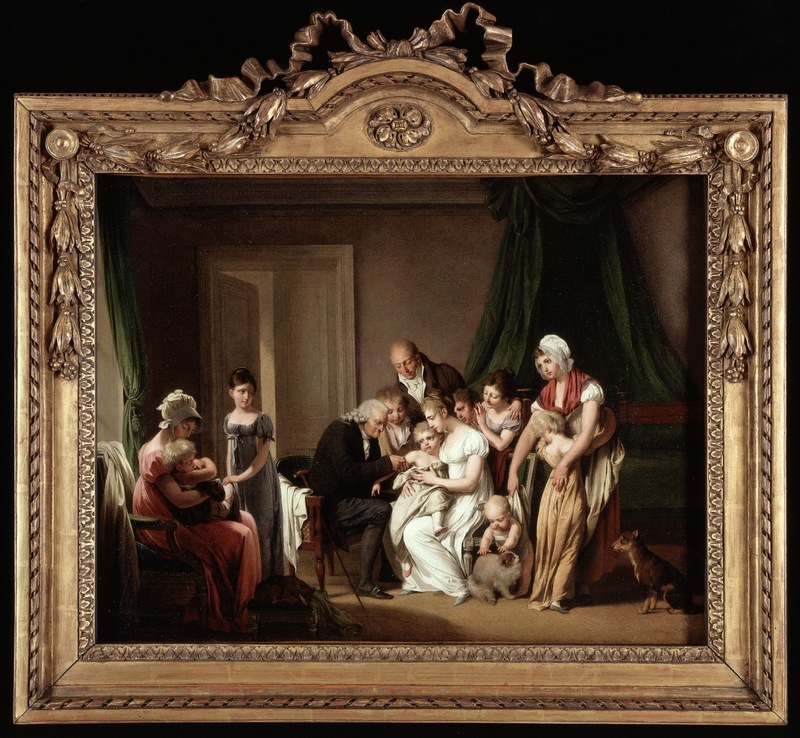 A further point that could be observed only by visiting the exhibition is that the ornate neoclassical frame of the Wellcome Library painting (above) has strong similarities to frames on two other works in the exhibition: no. 114, from the Louvre, and no. 184, from Saint-Omer. All three works passed through Galerie Charpentier: the Saint-Omer and Wellcome paintings both on 11 December 1934, the Louvre painting in 1959. Could the Galerie Charpentier have commmissioned these carved and gilt frames? Congratulations to Lille for a fitting tribute to its brilliant native son on his 250th anniversary. The exhibition is considered to be of national importance and has therefore received funds from the French Republic. It is also sponsored by the Wellcome Library’s Euston Square neighbours Grant Thornton. Unfortunately the exhibition is due to close on Monday 6 February, but for anyone who has a free day before that date, here is the Eurostar timetable from St Pancras to Lille. If you can’t make it, both Louis-Léopold and his son Julien Léopold (called Jules, 1796-1874) are abundantly represented in the Wellcome Library by their graphic work, which is not treated very thoroughly in the exhibition. 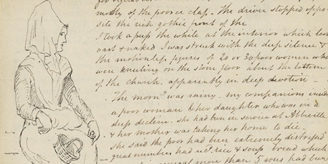 For students of the reception of literary works by women, the collection of portraits of women writers by Jules is particularly noteworthy (Wellcome Library no. 40182i). The Lille exhibition catalogue is also available in the Wellcome Library: click here for details. Other reviews of the exhibition available online include those of The Art Newspaper and La Tribune de l’Art. While researching my ancestor I noticed that you have the correct name for Emily Yznaga in the description of A Girl at a Window but the incorrect name for Consuelo Yznaga. Also attached are some links that show the correct spelling for Consuelo. Respectfully asking that her name be changed FROM Dona Maria Consuelo Yznaga TO Consuelo Yznaga. Also, your article states that she was a “sometime” Duchess. I think that “sometimes” should be removed because once she married she was a Duchess all of the time.